Medical astrology (traditionally known as iatromathematics) is an ancient medical system that associates various parts of the body, diseases, and drugs as under the influence of the sun, moon, and planets, along with the twelve astrological signs. Each of the astrological signs (along with the sun, moon, and planets) is associated with different parts of the human body. 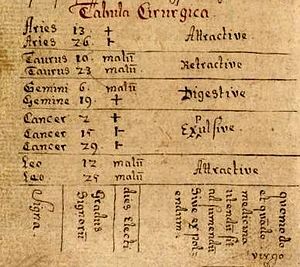 This table, from an 18th-century Icelandic manuscript, links astrological dates with the preparation of medicine. Medical astrology posits the association of each sign of the zodiac with parts of the body, and was already mentioned by Marcus Manilius (1st century AD) in his epic poem (8000 verses) Astronomica. The signs of the zodiac were believed to preside over the parts of the body, covering the body from head (Aries) to toe (Pisces). After examining an individual's natal chart, a medical astrologer may give advice to the client about the areas of the body in which they are most likely to experience trouble. ^ "Activities With Astrology". Astronomical society of the Pacific. "Objections to Astrology: A Statement by 186 Leading Scientists". The Humanist, September/October 1975. Archived from the original on 2009-03-18. Robert Hand. "The History of Astrology – Another View". Retrieved 2007-06-19. Richard Dawkins (1995-12-31). "The Real Romance in the Stars". The Independent, December 1995. "British Physicist Debunks Astrology in Indian Lecture". Associated Press. "Astronomical Pseudo-Science: A Skeptic's Resource List". Astronomical Society of the Pacific. Paul R. Thagard, 'Why Astrology is a Pseudoscience', PSA, vol 1. University of Chicago Press, 1978.